We filled this one to the brim with seasoned chicken, ranch sauce, red onions, smoked provolone, mozzarella, parmesan, romano, and asiago and definitely did not hold the bacon. 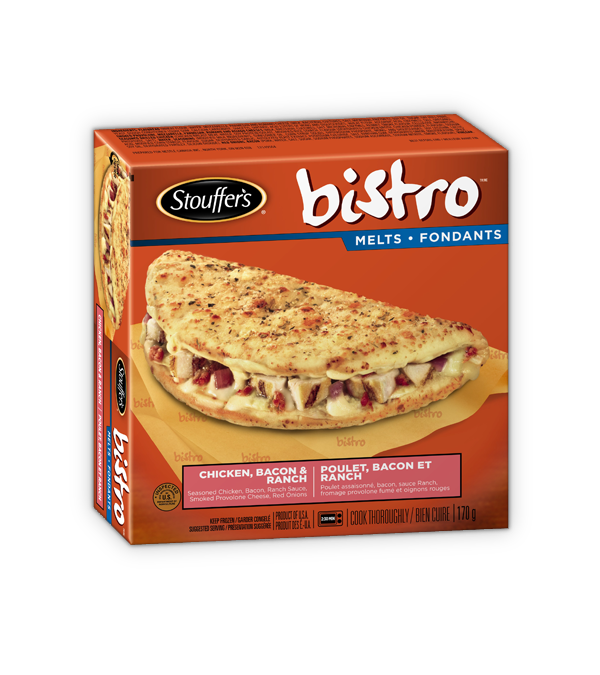 STOUFFER'S BISTRO Melts Chicken, Bacon & Ranch is rated 2.5 out of 5 by 4. Rated 4 out of 5 by At Work from Just Ate One for Lunch I just had one of these for lunch and was very happy with the taste, texture and ease of heating. A bit mild in flavor, but added a bit of sour cream and it was terrific! Rated 1 out of 5 by Ummnope from This is so disgusting This nastiness seriously tastes like puke! Not even joking it seriously tastes like I drank to much on a night out with the girls on a wine bring fest. Seriously who was in charge of letting this disgusting tasting product on the market.